Our favourite dresses are back in stock at Mott & Mulberry! These super comfortable, fluid garments are perfect for everyday and are so versatile in how they can be styled. We have made your job easy by styling three of our favourite Eva's Sunday styles for you, so you don't have to! Channel "French Chic" pairing Navy and Red together! Although bold, styling Red and Navy in an outfit shows sophistication in a simple way. The Eva's Sunday Cinta Dress in mallard check is pictured above with the Elms and King Bowery Wallet in Red and Elk Chunky Red Wood Necklace. Make the most of the Eva's Sunday Leah Dress in Snow's versatility and have fun with some vibrant colours. Mott & Mulberry favourite Kaleidoscope Tiff Manuell clutch looks fabulous with the pretty in pink Twisted Cube Bracelet and Rough Diamond Studs from Rare Rabbit. 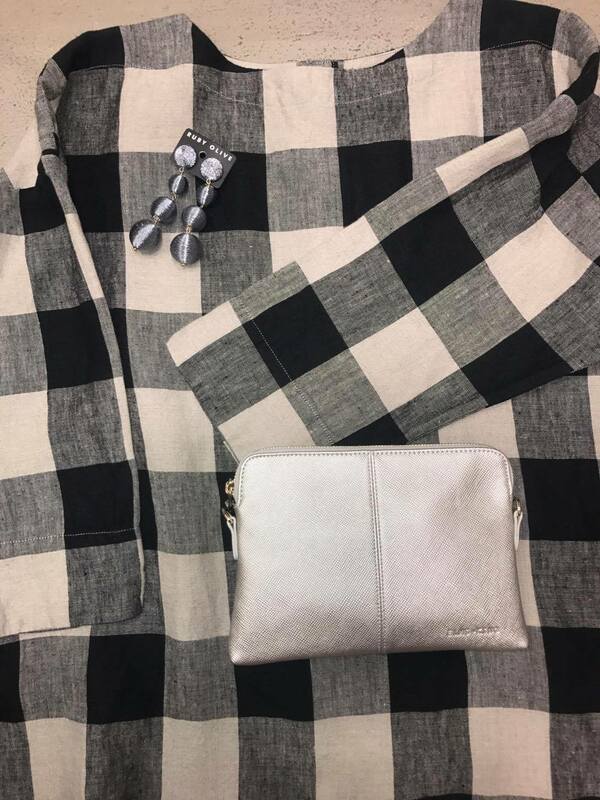 Add to the monochrome magic of the Eva's Sunday Cinta Dress in Raven Check with some metallic accessories! We love the Elms and King Bowery Wallet in Silver and the Carnivale Rocket Drops from Ruby Olive. This outfit is perfect for a night out with girlfriends! Like what you see? Call us on 3378 9414 to secure your size or favourite accessory in store today! The latest gift and fashion items delivered to your inbox a few times a month. We'll never share your email address and you can opt out anytime, we promise.